^ 3.0 3.1 2006 FIFA World Cup™ broadcast wider, longer and farther than ever before 互联网档案馆的存檔，存档日期2009-03-12., FIFA.com. ^ England National Football Team Match No. 1, England Football Online. ^ Byujhjjritish PM backs return of Home Nations championship. Agence France-Presse. [2007-12-16]. ^ History of FIFA - FIFA takes shape 互联网档案馆的存檔，存档日期2007-10-01., FIFA.com. 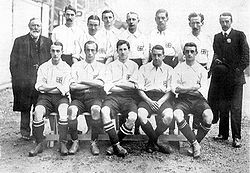 ^ 'The First World Cup'. The Sir Thomas Lipton Trophy. Shrewsbury and Atcham Borough Council. 2003-10-10. （原始内容存档于2003-11-29） （英语）. ^ History of FIFA—More associations follow 互联网档案馆的存檔，存档日期2012-06-08., FIFA.com. ^ The Olympic Odyssey so far... (Part 1: 1908–1964) 互联网档案馆的存檔，存档日期2009-08-02., FIFA.com. ^ History of FIFA - The first FIFA World Cup 互联网档案馆的存檔，存档日期2012-01-23., FIFA.com. ^ Molinaro, John F. Lucien Laurent: The World Cup's First Goal Scorer. CBC. [2007-05-06]. ^ FIFA World Cup Origin 互联网档案馆的存檔，存档日期2010-06-14.（PDF）, FIFA.com. ^ Scotland and the 1950 World Cup. BBC. [2007-05-13]. ^ Glanville, Brian. The Story of the World Cup. Faber. 2005: 44. ISBN 978-0-571-22944-4. ^ Record number of 204 teams enter preliminary competition 互联网档案馆的存檔，存档日期2007-11-17., FIFA.com. ^ FIFA Women's World Cup 互联网档案馆的存檔，存档日期2007-09-15., FIFA.com..
^ Regulations Men's Olympic Football Tournament 2008 互联网档案馆的存檔，存档日期2008-02-27.（PDF）, FIFA.com. ^ FIFA Confederations Cup, FIFA.com. ^ Jules Rimet Trophy 互联网档案馆的存檔，存档日期2013-03-18., FIFA.com. ^ FIFA World Cup Trophy 互联网档案馆的存檔，存档日期2008-04-12., FIFA.com. ^ FIFA Assets – Trophy 互联网档案馆的存檔，存档日期2007-11-04., FIFA.com. ^ FIFA World Cup qualifying: Treasure-trove of the weird and wonderful. FIFA. [2007-12-23]. ^ 2010 World Cup Qualifying. ESPN. 2007-11-26 [2007-12-23]. （原始内容存档于2008-12-16）. ^ 1938 FIFA World Cup France Preliminaries. FIFA. [2007-12-27]. （原始内容存档于2007-12-28）. ^ England seeded for 2006 World Cup. BBC. 2005-12-06 [2007-12-24]. ^ 此制度由1986年世界盃始設立。在以往一些事件例如1978年世界盃阿根廷6：0勝秘魯、1982年西德1：0勝奧地利等，參與「尾場」的球隊能知道「早場」球隊的賽果，以改變戰略從中獲益，還會使用俗稱「走線」的讓賽，使自己能「選擇」對戰那些隊伍1978年阿根廷 互联网档案馆的存檔，存档日期2008-12-16.和1982年西班牙 互联网档案馆的存檔，存档日期2008-12-16., CBC Sports. ^ Regulations of the 2010 FIFA World Cup 互联网档案馆的存檔，存档日期2007-09-26.（PDF）,（40–41頁）, FIFA.com. ^ Formats of the FIFA World Cup final competitions 1930–2010 (PDF). FIFA.com. [2008-01-01]. ^ Uruguay 1930. BBC. 2002-04-11 [2006-05-13]. ^ Asia takes World Cup center stage. CNN. 2002-06-03 [2008-01-01]. ^ Brazil will stage 2014 World Cup. BBC. 2007-10-10 [2008-01-01]. ^ Rotation ends in 2018. FIFA.com. [2007-10-10]. （原始内容存档于2007-11-01）. ^ 國際足協將捷克斯洛伐克/捷克、南斯拉夫/塞爾維亞和黑山/塞尔维亚、蘇聯/俄羅斯的紀錄視為同一隊伍的紀錄。 Planet World Cup - All time table. Planet World Cup. [2008-01-26]. ^ Zentralrat empört über "privaten Judenboykott". Spiegel Online. 2007-10-09 [2007-10-09] （德语）. ^ South Korea results from 2002 World Cup now under scrutiny. Eurosport. 2015-05-29. ^ Golden Ball for Zinedine Zidane. Soccerway. 2006-07-10 [2007-12-31]. （原始内容存档于2008-12-11）. ^ Kahn named top keeper. BBC. 2002-06-30 [2007-12-31]. ^ 57.0 57.1 FIFA Awards. RSSSF. 2007-05-18 [2008-01-08]. （原始内容存档于2016-01-12）. ^ Chowdhury, Saj. Ronaldo's riposte. BBC. 2006-06-27 [2007-12-23]. ^ Goal machine was Just superb. BBC. 2002-04-04 [2007-12-23]. ^ Yannis, Alex. Matthaus Is the Latest MetroStars Savior. New York Times. 1999-11-10 [2007-12-23]. ^ World Cup Hall of Fame: Lothar Matthaeus. CNN. [2007-12-23]. ^ Kirby, Gentry. Pele, King of Futbol. ESPN. 2006-07-05 [2007-12-23]. （原始内容存档于2008-12-16）. ^ Brewin, John. World Cup Legends - Franz Beckenbauer. ESPN. 2007-12-21 [2007-12-31]. （原始内容存档于2009-11-19）. ^ Hughes, Rob. No Alternative to Victory for National Coach : 150 Million Brazilians Keep Heat on Zagalo. International Herald Tribune. 1998-03-11 [2007-12-31]. ^ 1938 France. CBC. [2007-12-31].